Crazy week in Britain, huh. Among the most amazing things about the Brexit result, in my mind, is that such a momentous decision was left to be decided by a simply majority of ballots cast. Approximately 52% of ballots (17,410,742) were cast in favour of Leaving the EU. 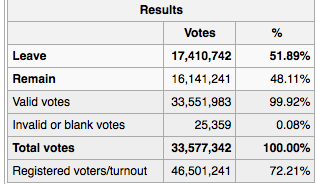 About 72% of eligible Britons (46,501,241) cast ballots. That means that just over 37% of Britons voted to leave the European Union, and their choice rules the day. Of course, our democratic process also operates on the basis of majority of ballots cast. If a political party was required to win actual majority support in order to govern, no party would ever win. Stephen Harper’s Conservative government won a majority government in 2011 even though less than a quarter of Canadians (24%) voted Conservative. However, the Brexit vote was different. Someone needs to win a political election. We need a government. The question put to a vote in Brexit was whether to change the long-standing status quo. Remain could have been treated as the default model, and the law could have required that Leave obtain greater than a simple majority of ballots cast in order to overrule the default political system in effect since 1973 and throw the UK into an era of uncertainty if not chaos. A petition circulating in Britain calls for a rule that the Brexit vote be annulled if less than 60% of votes are cast for Leave or Remain based on a turnout of less than 75%. But it’s a little late for that, even though nearly 4 million people have signed on. The Brexit vote parallels an employee vote to move from the non-union, Common Law Regime to the unionized Collective Bargaining Regime under the Wagner model of majoritism and exclusivity that governs unionization in Canada and the U.S. In a unionization contest, nonunion employes are asked whether they wish to alter the default, non-union model by choosing instead to be represented by a union. Nowhere in North America is the unionization contest decided by a one-step, simply majority of ballots cast as was the case in Brexit. In the U.S., a union must first obtain union membership cards representing at least 40% of eligible employees (bargaining unit employees), and then the union must also win a ballot as a second step. This is known as the mandatory ballot model. In Canada, we use two models for testing whether employees want to move from the default nonunion model to the union model. Most jurisdictions now use the American-style mandatory ballot model. In order to get a vote, the union must first present evidence showing that some percentage of employees are union members (or in Alberta, that they have signed a union authorization card indicating they want the union to represent them). That threshold level varies from 35% (in Quebec) to 45% (in B.C. and Saskatchewan). The most common threshold is 40% in order to get a vote. Usually, if the union gets a vote, then it must only win a majority of ballots cast. However, in Newfoundland & Labrador, the union must obtain votes on behalf a majority of eligible voters, or a majority of ballots cast but only if 70% of more of eligible employees vote. Note that it is possible in all jurisdictions that use a mandatory ballot model for a union to win certification without having obtained the support of an actual majority of eligible voters. For example, if there are 100 eligible voters, the union can obtain a vote by submitting 40 (or in some jurisdictions, 45 membership cards). If a vote is then held, and only 80 employees vote, the union would win certification by obtaining 41 votes (or 50% plus 1 of the voting constituency). However, even then, the union still needed to obtain substantial employee support in order to get a vote in the first place. Neither Leave, Remain, or Stephen Harper’s Conservatives (or any Canadian political party for that matter) obtained the support of 40 percent of all eligible voters. In Quebec, Manitoba, New Brunswick, and P.E.I. (and the construction sector in Ontario), a union can win certification without a vote under the second model for testing employee wishes known as the Card Check Model. Under this model, a union proves majority support by collecting union membership cards on behalf of a majority of the entire constituency of employees. In Manitoba (for now), the union needs to submit membership cards on behalf of at least 65%. In New Brunswick it is 60% or more. In Quebec and P.E.I., the union needs only a majority of the bargaining unit (more than 50%). Note that in the Card Check Model, the union must obtain the support of an actual majority of employees eligible to participate in the decision about unionization. Opponents of collective bargaining argue against the Card Check Model on the basis that it is ‘undemocratic’. I have never found this argument persuasive. If 60 or 70 out of 100 employees sign a union membership card indicating their desire for collective bargaining, then it is hard for me to see how certifying a union based on that evidence is less democratic than a ballot result in which a union wins by obtaining 51% of ballots cast. I haven’t done or read a study of this, but in my own experience as a lawyer doing loads of union certification applications in both B.C. and Ontario, if a union applies with membership cards representing more than 65% of employees, they always win the certification vote, unless the employer breaks the law by threatening harm if the union wins. Holding a vote when a union submits such strong evidence of employee support is a waste of taxpayer money and scarce labour board resources. Remember that all a union wins by obtaining certification is an opportunity to sit down with an employer to try to bargain a first collective agreement that a majority of employees will vote for, because they think it is preferable to the nonunion employment contract that presently governs their employment relationship. If the union can’t bargain such an agreement, then it will not last very long. That’s why my preference would be for a Card Check Model when the union submits membership evidence on behalf of at least 65% of bargaining unit members. In that case, the government should just certify the union, and tell the parties to get on with collective bargaining. It’s interesting that Canadian unions are required to demonstrate a higher level of employee support in order to obtain a licence to bargain on behalf of employees than the Leave campaign needed to show in order to pull Britain from the European Union. 1. Is the Card Check Model of union certification ‘undemocratic’, as Mandatory Ballot proponents argue? 2. Studies show that union success rates in applications for certification fall by as much as 19% when a government switches from a Card Check Model to a Mandatory Ballot Model. What do you think explains this outcome? The models used to test employee wishes about whether to unionize will be discussed at length in a chapter in the forthcoming Part IV of the book that explores the Collective Bargaining Regime. 2 Responses to Is the Test to Unionize Tougher Than to Leave Europe? I believe the rules for statutory trade union recognition in Great Britain are somewhat more onerous than the North American mandatory ballot model. A union must secure a majority of those voting and 40% of those eligible to vote. A good explanation of this can be found in “Statutory Regulation and Employment Relations” by Sian Moore and Sonia McKay. It seems that the voting procedures for such an important question as to whether to remain in the EU were not well thought out. Also, should Scotland and Northern Ireland be carved out as they voted to remain? The analogy here is with regimes where multiple trade unions are permitted in a workplace. So, Scotland and Northern Ireland can remain in the [European] Union and England can stick with its common law. Thanks for this David. Nice analogy! I definitely agree that there should have been a higher standard in the Brexit vote – the margins for the leave group winning were so small! But I really like the case for the card count actually being the more democratic route. As a friendly edit: I think you mean 51% in your example with 80 and 41 ballots.